There are at least 500 Jewish students studying at Grenada’s St. George Medical School, but until recently, they were left to fend for themselves when it came to Jewish life. For many, that meant putting a hold on their Jewish identity. In fact, Rabbi Michael Melnick, today the Ambassador-at-Large for Grenada, recalls asking a young Jewish student how he manages to keep up his Jewish commitments while in Grenada. “I have put that part of my life on hold and will get back to living as a Jew when I’m done with my schooling,” the student told him. The response was so disheartening, it prompted Melnick, who lives in Brooklyn but does business in Grenada, to bring a Torah scroll and prayer books to the island. Chabad rabbinical students visited often, but the need for a Jewish student center was long overdue, and Melnick went out of his way to help Rabbi Baruch and Chaya Rozmarin get settled in their new role: Chabad representatives to the “Island of Spice” in the southeastern Caribbean Sea. Home to one of the best medical schools outside the U.S., Grenada is a draw for international students, and the university is eager to accommodate them. Dr. Charles Modica, Chancellor of St. George University, has reached out, assisting the young couple in establishing a Jewish student center on campus. “Dr. Modica has been welcoming and so helpful to us. He’s already made some changes to accommodate the needs of Jewish students, allowing them to reschedule tests when they fall on Jewish holidays,” Rozmarin told lubavitch.com. 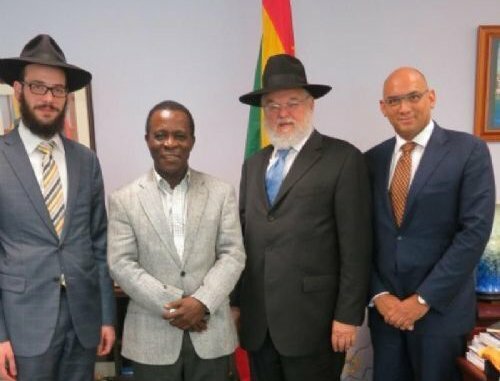 The couple arrived in December, but Rabbi Rozmarin has already been named Grenada’s Chief Rabbi by Grenada’s Prime Minister Keith Claudius Mitchell. The PM, said Rozmarin, is committed to securing a property for the student center and the country’s first synagogue ever, giving the new Chabad representatives a jump on their $2 million capital campaign. Until then, they’ll continue working out of their rented home. So far, they’ve been hosting 70-100 students for Shabbat dinner. Registration for the Passover seder has not even opened, but the Rozmarins have already received calls and emails from 170 students asking to reserve a place. In addition to the large Jewish student body, Chabad will look to meet the needs of some 20 Jewish families who live locally. Some have moved there on business, and others are affiliated with the University. Now they will finally begin to enjoy the benefits of a Jewish community.